The following comments respectfully address Sean Casteel’s article, The Dark Side of Flying Saucers – Are We Dealing With Something Evil? at www.ufodigest.com/article/dark-side-flying-saucers-are-we-dealing-something-evil#comment-1162. Please note that the readership of UFOdigest is different from the readership at the 2012 Scenario. I’ve therefore used a different vocabulary when discussing coming events. I’ve restricted my explanation to some topics and excluded others. Some readers may say but you haven’t mentioned the Earth allies, the ascended masters, NESARA, interdimensionality, or Ascension. No, I haven’t. I’ve tried to keep my article within a range that I think that magazine’s readership would accept. Sean, your comments about dark aliens are very well put and are probably accurate for a past time but you may find that they may not be accurate any longer. The galactics who are here around this planet, having come from distant places like Andromeda, Arcturus, the Pleiades, and Sirius, are not prevented from also communicating with us and of course they do communicate, through channels. Some channels are reliable; some are not. If you wish to have the galactic perspective on what you say here, it is quite easily gotten. 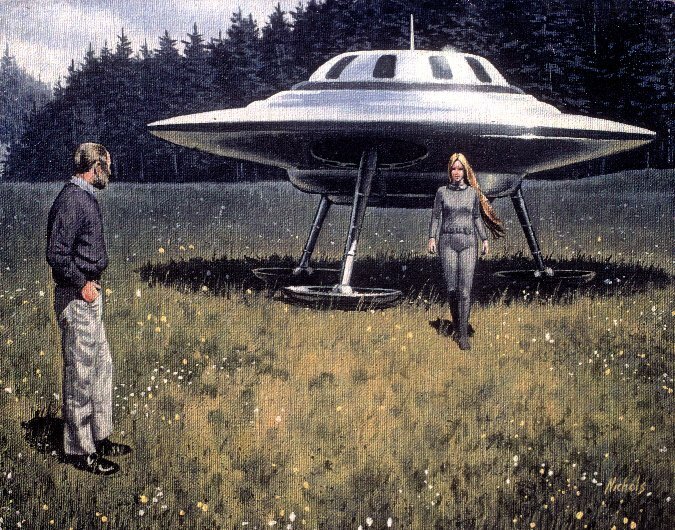 What SaLuSa and other sources say is that the Greys did in fact abduct people, use them for sexual breeding, and so on some time ago, but they are either no longer on the planet or are leaving. Please remember that the Greys enacted treaties with the U.S. government which allowed them to abduct in exchange for their technology. Such devices as the silicon chip, kevlar, teflon, fibre optics come from alien technology. All dark aliens are prevented from coming to the planet now by (1) the opposition of the galactics themselves or (2) the barrier presented by the rising light energies that surround the planet which the Greys find difficult to endure. The same applies to other aliens of dark intent – the Anunnaki as well, for instance – none of whom can tolerate the higher light levels. Why are the light energies around the planet increasing? Well, I’m sure you’ve heard of what is occurring in 2012. We are heading for a planetary shift or transformation at the end of that year which is being orchestrated by the galactics from a number of star councils and federations, working for this planet’s hierarchy. This shift is of course the subject of the Mayan calendar. It is taking place throughout the universe, not just here on Earth. The governments of the world are presently discussing what plans they will follow to end the UFO cover-up that has been in place since the CIA’s Robertson Panel ordered it in the 1950s. After disclosure will come First Contact, in which the galactics will land on the planet and begin working with us towards the shift. Plans have already been made to create a new economy on Earth, to terraform the planet, to introduce new technologies, etc. I’m sure you know that the galactics have not allowed nuclear bombs to be exploded on the planet, under it, or in space for many years now. (The North Korean explosion was not nuclear, though it was represented as being so.) You can listen to the testimony of the Hastings Panel but there is much more literature available on the subject. You may not know that they have relieved the planet of its burden of depleted uranium in the atmosphere, which alone would have killed off life here. A very small dose of DU is lethal, as I’m sure you know. They have also rid the atmosphere of non-DU nuclear fallout from bomb detonations. They have curtailed the flow of oil in the Gulf of Mexico. They mitigate the damage from chemtrails and HAARP weather warfare. They have neutralized the many manmade pandemics produced out of Fort Detrick, such as SARS, Swine Flu, and even AIDS. They are not waiting for disclosure to assist us but are helping now from their ships, most of which are cloaked. However the sightings of UFOs are increasing, as I’m sure you know, and becoming more spectacular in the ramp-up to disclosure. One of the more spectacular sightings happened at the Dome of the Rock recently. Another was the fleet that appeared over New York on Dec. 13, 2010. It is the increase in consciousness from the rising light energies that is causing such things as the outbreak of rebellion in North Africa. It is expected that freedom protests will spread all over the world before they are finished. You can see they are also spreading in the United States from Wisconsin outward. It is intended that the cabal or elite that goes under many names – the Illuminati, New World Order, Military-Industrial Complex, shadow state, whatever you wish to call it – will be neutralized and in fact this has been an ongoing effort for quite some time. Things like the phony “war on terror” were initiated by the equally phony 9/11 false-flag attack, which itself is only one among many phony attacks, such as the London bombings, the Mumbai assault, the Oklahoma City bombing, the various airplane bombings using mind-controlled Manchurian candidates, etc. They were all staged to cement control over the population and to start wars in Afghanistan and Iraq for various reasons. The galactics stopped the cabal before it could attack Iran, although it tried. In my opinion, we terrestrials could not have defeated the Illuminati’s plans to depopulate the globe and bring the world population down to 500 million from 7 billion without the assistance of the galactics. But few people know this. It will all come out after disclosure. So while SETI is supposedly listening for beeps and clicks, SaLuSa, Mira, the Pleiadian Council, the Arcturian Group, Kryon, and many other galactic sources have been addressing us for years. So there is no need any longer to fear the Greys and the Anunnaki. In fact there is no need to fear anything. Our future is not only assured but it is going to be nothing short of spectacular, when viewed from our present standpoint. While some Earth changes will take place that will result in some tumult (volcanic eruptions and earthquakes, for example), in general there is nothing to fear about our future. These planetary events are happening to prepare the Earth for the shift that is to take place. As soon as the cabal has been defeated, which is actually only months away probably, major changes in every aspect of life will occur and I think everyone will be quite pleased with what is in store for us. If you wish to read more about the dark aliens, I have numerous articles on my website, The 2012 Scenario, in the righthand column.